President Donald Trump’s reported derogatory remarks about Haiti and slur against immigrants from “shithole” countries in Africa sent shockwaves around the world, simultaneously becoming a diplomatic issue that could damage America’s global image and complicating an immigration reform effort at home. Shock and outrage greeted Trump’s remarks in a meeting with lawmakers on immigration reform on Thursday. Several countries called in US ambassadors for an explanation and to remonstrate with them over the President’s language. Lawmakers expressed disappointment and disgust, with one declaring the comments counter to the very “essence of American patriotism.” Even as Trump’s comments provided fodder for late night comics, they raised questions about whether he has now made it harder for lawmakers to find a compromise to achieve immigration reform. Critics in the US and abroad noted that Trump’s sentiment cut against the idea of the United States as a nation of immigrants and the foundational view that the content of person’s character is more important than their origin or the color of their skin. Many of those who criticized Trump said his remarks would damage America’s global reputation. Sen. Lindsey Graham, a South Carolina Republican who has maintained a close relationship with Trump while at times being critical, was at the meeting Thursday. Trump on Friday also denied demanding that Haitians be removed from negotiations about protected status for people from certain countries. Former Democratic presidential candidate Hillary Clinton weighed in, noting that Trump dismissed Haitians on the eve of the eighth anniversary of a deeply destructive earthquake. The African Union, a group representing the continent’s 55 countries, issued a blistering statement saying the President had dishonored US values. 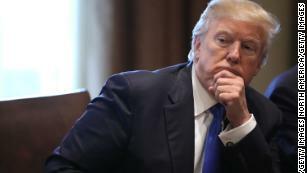 “The African Union Mission wishes to express its infuriation, disappointment and outrage over the unfortunate comment made by Mr. Donald Trump, President of the United States of America, which remarks dishonor the celebrated American creed and respect for diversity and human dignity,” the AU mission in Washington said in a statement. The group demanded “a retraction of the comment as well as an apology, not only to the Africans but to all people of African descent around the globe.” Saying they believe the administration has a “huge misunderstanding of the African continent,” the union said “there is a serious need for dialogue” between the Trump administration and African countries. Iran’s Foreign Minister, Mohammad Javad Zarif, called the remarks unacceptable. “Unfortunately, today the head of government in the US is so ignorant as to use the foulest language about the nations, which is quite unacceptable and even unbelievable,” he said Saturday, according to the semiofficial Mehr News Agency. South Africa’s best known morning-news anchor, Leanne Manas, tweeted, “Good morning from the greatest most beautiful ‘shithole country’ in the world!! !’ Elsewhere on Twitter, many Africans posted landscape pictures testifying to the true identity of their nations. “I reject them and condemn vigorously. Africa and the black race deserve the respect and consideration of all,” Sall added. Botswana’s Ministry of International Affairs summoned the US ambassador to complain about Trump’s disparaging comments. “The Bostwana Government has also enquired from the US Government through the Ambassador, to clarify if Botswana is regarded as a ‘shithole’ country,” the statement said. Trump’s comments hit hard in Haiti, which on Friday marked the anniversary of a 2010 earthquake that killed between 220,000 and 300,000 people. In an interview with NPR, Haiti’s ambassador to the US, Paul Altidor, said he was “surprised and disappointed” in Trump’s remarks. “If they are to be true, we hope there will possibly be an apology for what was said here because we thought they were misplaced, they were misguided,” Altidor said. The ambassador said the Haitian government had summoned the US chargé d’affaires to clarify the remarks. “Our values as a nation bond us together and define who we are,” he said, and “form the foundations of trust” in the workplace. A source familiar with Thursday’s meeting said the President did not refer to Haiti as a “shithole” country, though he did say it about countries in Africa. The source said two different remarks by the president had been conflated. First, when talking about “temporary protected status” countries as part of the immigration deal, it was mentioned that Salvadorans, Hondurans and Haitians have that status. “Haitians?” the President said, according to the source. “Why do we need more Haitians? Take them out.” Meaning take them out of the deal. A Senior State Department official said US ambassadors had been issued guidance on how to deal with the remarks if called in by foreign ministries to explain them. The official said each envoy should note what an honor it is to be in their post and how much they value the relationship with the people of their host country.